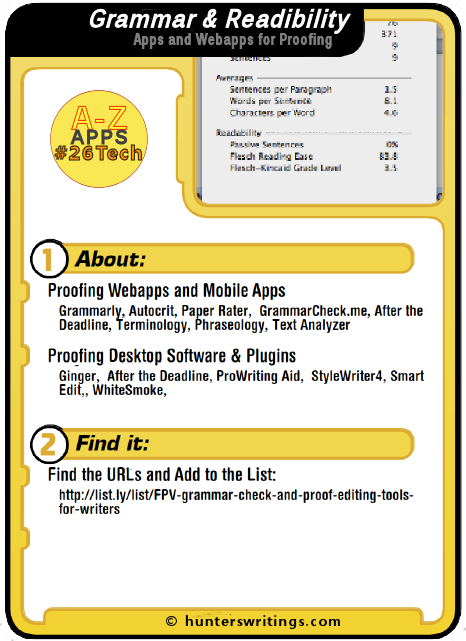 The G post for #26Tech A-Z Challenge will preview some of the helpful grammar or proof-editing tools available to a writer. Nothing will ever alter the requirement for a writer to proof-read and check their own writing work (or hire a fresh set of professional eyes to do so) but there are a few tools which automate grammar checks and provide some data fly-throughs to give a writer a view of the readability of their work. Find the listly list of these apps here, and please add your own. This is a long post, designed for comparative browsing. I’ve not used any of these apps fully, so am only listing the most discussed apps and services. Grammarly promises to identify over 250 text errors, improve word choices with vocabulary suggestions and check for plagiarism. While it’s free to input some text to have checked, you need to sign up for a seven day trial to see the problems they found. Subscriptions – $30 monthly, $60 quarterly or $140 for the year. Autocrit is a similar web-based offering specifically targeting writers with promises of being an instant book editor. The free trial webpage requires at least 200 words to use and like Grammarly, you need to register to get the free analysis report. Guest registrations entitle a reasonable usage of the site. Membership packages range from $47-$117 per year, packaged towards bloggers to full novel manuscripts. PaperRater targets the educational student paper market, so requires title, education level and type of paper inputs. If you get through the dreaded Captcha the free webapp (there may be payment options at a later date) does grammar, spell checking and checks for plagiarism. Ginger provides a grammar and spellchecker. The software (for Windows PC only) adds proofreading functionality to a Microsoft Word, Outlook, PowerPoint and browser extensions for Chrome, Firefox, Safari and IE. There is also a Personal Trainer feature designed for English language training, an Android App, and a premium feature of text-to-speech. You can play around with the 600 character limited Ginger webapp and download the software. Monthly and yearly plan options, ranging from $4 – $10 per month. After the Deadline is opensource and free for personal use. It is available in several languages. Like the others above, test After the Deadline out on the website. With contextual spell and style checking, the plugin is also in WordPress.com – activate After the Deadline by following the proofreading instructions. The software is also available as extensions/plugins for a variety of message boards and browsers including Chrome and Firefox, and for OpenOffice and Windows Live Writer. ProWriting Aid is a free online writing editor and personal writing coach with grammar, spelling and plagiarism checks. Once you input the text, you are returned a screen which includes some reports on findings, but the plagiarism check must be purchased as a bundle. The Premium upgrade from free provides additional and faster checking features, and ranges from $35, includes a Microsoft Word plugin download. Terminology and Phraseology are apps by Agile Tortoise – the creators of my favourite iOS writing app, Drafts. Terminology is one of the best dictionary and thesaurus apps available. The app is integrated into Drafts, making it easy to explore the English language and your word choices through many web-based systems. Terminology can be extended by custom or templated actions. Available for around $4. Phraseology is a plain simple text editor app for iOS which, like big sister Drafts, has Markdown and Text Expander support. $3. What makes it great is the “Inspect” mode which breaks out commonly used (overused) words and provides stats on readability levels. Text Analyzer provides text analysis – wordcount, character count, parts of speech (nouns or verbs used, adverbs, determiners etc). Find overused words or phrases and patterns in your writing. It is available for $2 for the iOS app, $3 for the Mac app. StyleWriter4 has a 14 day free trial. After this choose from three packages – ranging from $90-$190. The install plugs in to your text editors (such as Word) providing a toolbar button. StyleWriter provides statistical reports and readability reports through the more expensive packages. SmartEdit is a popular writing package by the makers of PageFour. Similar to the above, SmartEdit has a 10 day free trial, then must be purchased for $57. The software works with files from MS Word or OpenOffice, running over 20 tests for readability, word choice, spellcheck and misused words. WhiteSmoke Writer claims to be the leading writing correction software on the market, and that it works through anywhere you type – MS Word, Outlook, or any other text-editing software or web browsers. Providing grammar, spelling and writing style checks, you use it via the F2 function button on your PC. There is no trial version to download, but various pricing plans – starting at one year for $80 with a Premium version offering access to the WhiteSmoke Anywhere webapp. Each package comes with a free add-on of a WhiteSmoke keyboard for Android. MS Word, admittedly the one piece of software you are best bets going to find on a writer’s desktop – has some functioning spell and grammar check options. In fact, in this writer’s test of Grammarly, After the Deadline, Ginger and MS Word (plus his wife) Word came out top in tools. GrammarCheck.me is a free online grammar and spellchecker. SpellCheckPlus.com is another free grammar and spellchecker, with some text editing functions thrown in. Word Counter – online counter – paste in a scene and it will tell you how many sentences and paragraphs there are, average sentence length and top ten words used. If you are writing on mobile devices, then there are many popular online dictionaries (Merium-Webster, Dictionary.com, et el) with good apps to install. Here’s the App Advice (for iOS) list of good Dictionary apps. #26Tech: This was the G post for my A to Z challenge, where this blog will be posting 26 days worth of Tech posts relevant to writers and creatives. I am always wary of automated or software proof and grammar checks. I am even more cynical about software that rates gramnar or readability. There is no substitute for a human in all these things. The other day I discovered an app called Hemingway. When I typed gibberish it gave a better rating than my own sensible writing. I posted on Hemingway not long ago. I tend to agree with what you say about most of these automated checkers, and am very aware that I will be seeking out a dedicated fresh pair of eyes on my own work when it comes time. But a few of these tools offer some interesting stats on word usage which I’ve found helpful in applying towards improving my own text as a new writer. I’ll be interested in seeing how other writers take to these. I tried out Grammarly a few years back (so it may have been improved in the intervening time) and found it no better than the grammar checker in Word. It found a few glaring mistakes and caught my inability to put a comma before the word but. I think these tools are a great step in the editing process but can’t replace a good set of eyes. They are probably worth using before you give your manuscript to a professional copy editor. Thanks for another excellent post, Hunter. I am bookmarking this page because I can always use some help with where to put my commas. Thanks for another helpful post! I’d only heard of Grammarly. The others were a surprise. Thanks!